HG's New Chinese Restaurant Survival Guide! Get ready for a Chinese-food survival guide, people! We'll have this information in your brain in five minutes or less; no charge for delivery and no minimum order! You probably know (since we say it ALL the time) that starting a meal with broth-based soup is a good way to avoid consuming more calories than you should. SOUP ROCKS! Meaning that these are rules for mealtime... though mealtime DOES rule. When you order one of those protein 'n veggie dishes, ask if it can be steamed and served with the sauce on the side. (Most places are cool about this if you ask nicely.) Stick to lean meats and vegetables -- nix the breaded, fried, crispy stuff. And when the food comes, DIP your fork into the sauce; you'll use WAY less than if you pour, but you'll still get the flavor. If you're a rice lover but still want to eat smart, here are a few tips. First, skip the fried rice. (Doy.) 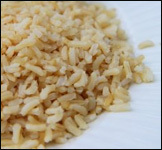 Second, if the restaurant has it, go for brown instead of white -- the extra fiber makes the rice more worthy of its calories. Third, watch your portion size. The server might bring out a big bowl. You do not have to eat every grain in that bowl. 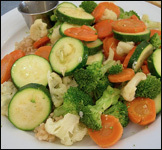 Spoon a bit onto your plate and eat plenty of your veggies and protein with it. 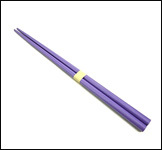 If using chopsticks isn't exactly second nature to you, give it a go anyway. Think about it this way -- working with these sticks will likely cause you to eat slower. And eating slowly allows your stomach to process the food you've already eaten, so your brain gets the message that your stomach is full before you've had time to overdo it. Cool! Looking for a little sweetness filled with some vague advice, prediction, or observation about your character? Grab a fortune cookie. 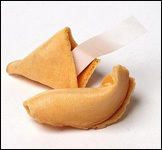 Fortune cookies are fat-free and contain about 30 calories each. And enjoy those orange slices many places serve at the end of the meal! 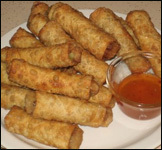 The average serving of egg rolls (2 small rolls or 1 large one) has about 350 calories and 15 grams of fat. And it's generally consumed before the meal even arrives. Ouch. Eggs + oil = DANGER! A meal-sized serving of egg foo young has about 600 calories and 40 grams of fat! If you can't fathom the thought of a Chinese meal without fried rice, bear this in mind: A 1-cup serving has around 400 calories and 13 grams of fat. And since it's often just a side dish, it's REALLY easy to get into trouble with that stuff. Kung pao chicken? No thanks -- 500 calories and 26 grams of fat for an average dinner portion (without sides or rice!) is not how we roll. Enjoy all your favorites without all the excess fat and calories! Wowowow! 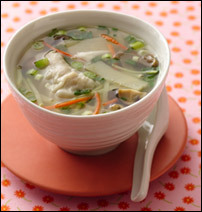 Wonton Soup - Wontons ROCK... and so does this soup! Shrimpylicious Egg Rolls - Big, beautiful, and baked (not fried). These shrimp-tasticly crunchy rolls will win your heart. Sweet 'n Sticky Sesame Chicken - Your days of longingly gazing at disastrously fattening sesame chicken are over -- our swap will set you free! Egg-cellent Foo Young - Eggy goodness with awesome sauce... GUILT-FREE. Good deal, eh? So Low Mein w/ Chicken - Invite noodles back into your life with this low-calorie recipe! Mmmm-azing Moo Shu - Our moo shu is nothing like the oily business you find at restaurants. Eat it up! Veggie-rific Fried Rice - Made with brown rice, lots of veggies, and very little oil, this fried rice is totally allowed on your plate. 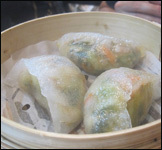 The Crab Rangoonies - Because... why WOULDN'T you want crispy wontons filled with crab and creamy cheese? WOW Kung Pao - "WOW" is right -- you'll go nuts for this Chinese-restaurant-staple swapper! You don't have to print copies of this email and pass 'em around like takeout menus -- just click "Send to a Friend" to hand them out electronically! Awww, it's the end of National Soyfoods Month! Did you eat any soyfoods? If not, check out some of the soy products in last Friday's email!